It has to be said that a bit of craft is great fun. Fiddling around with real life objects (as opposed to digital ones) is not only enjoyable but also allows you to create some fantastic digital effects that would be very hard to make using only Photoshop (although of course a bit of polishing on the computer will help to make the final project look even better). 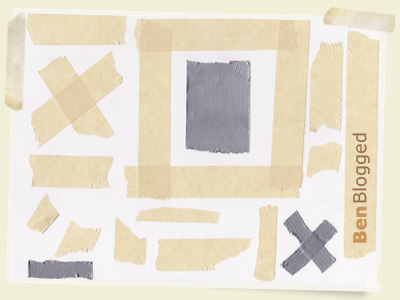 It’s amazing what a bit of tape will do – and it’s cheap too. I’m not saying that these tape images are suitable for O2 or BP or some super corporate company, but they look great on a blog like mine – or yours! When you’ve got the hang of creating your own tape images you can go on to create other similar pictures. Different shades and textures of paper, stamps, packaging and postcards all make great resources. Get creatin’ folks. Thanks for this excellent source. Saves me some time! Keep it up. Very Good! I was looking for something like this for a while. Like the grunge look generated by the tape. You’re the man. You look great…. uhmm so where’s the tutorial? Almost forgot about that… thanks for the heads up. Coming soon! i love these! thanks so much for sharing them! Thanks for this images. im looking this for hours. thanks a lot. Thanks for this!! Love the look and feel it can add to works!!!! Awesome!! I’ve been looking for these “scotch tape” effects for a long time!! Awesome, thank you!!!! It’s because of selfless people like you that I am developing skills so fast. thanks, I will use it for an invitation card for the christening of my daughter. thank you so much! this stuff exist for me! I was looking for something fun for a digital scrapbook, this is great thanks for sharing! Thanks a lot for the web-elements. I am working on a new project in grunge style. Think that this graphics could become helpfull for that. Sorry for my bad english. Kind regards from Germany. Hey thanks for this tech-freak post! I love your website very much. anyways, for web development and graphics design information, visit thetechnofreak.com Thanks! Thank you for this! Will check out the rest of the site! Just stumbeled upon these and wanted to say thank you! These ones are great! @Bee glad you like them, you are very welcome.